UNDER Alan Pardew, Newcastle United’s players are nothing if not well prepared. It is not unknown for bespoke DVDs detailing the strengths and weaknesses of their opponents to be delivered to United players in the run-up to weekend games, while the 45-minute video analysis sessions are a weekly staple for the squad. Yet none of that has been necessary for Steve Harper this week. He will be Newcastle’s last line of defence against one of the most fearsome strike duos ever to be paired together in the Premier League, and for his football-mad nine-year-old son James, it has been the only thing on the dinner-table agenda over the last few weeks. “I’ve played against some pretty useful strike forces down the years, but not too many as good as Wayne Rooney and Robin van Persie,” Harper admits. “In fact, my nine-year-old son James is taking great delight telling me how good the two of them are! Apparently, he knows more about all the strikers in Europe than I do. It is a fair assumption on Harper Junior’s part. Newcastle might well be moving into some good form but tomorrow provides the sternest examination yet of their top-four credentials, which have not always looked convincing this season. Effective but unspectacular, United have moved into mid-table on the back of grinding out results rather than sweeping away opponents. The swaggering midweek defeat of Bordeaux should provide a much-needed confidence boost, but the presence of that revered front two in the visiting line-up is also exercising minds. “A clean sheet against that strike force would really mean something,” Harper says. For a start, it would mean we’ve got something out of the game. I actually had one against Manchester United about 25 years ago when we beat them 3-0 and big Dunc (Ferguson) scored a cracker. Shearer scored as well. “John Burridge used to say to me when I was a kid just starting out here that a clean sheet is a goalkeeper’s hat-trick and I’ve quoted that a few times. So I’m after a hat-trick! “The guys were outstanding in January when they beat them. Man United came here after losing at home to Tottenham and will be looking to get a very positive response. “We are under no illusions just how tough it will be, but we will go in full of confidence because we have just beaten a good side. Newcastle will certainly not fear Manchester United, who have something of a mixed record on Tyneside. Although there have been occasions when the Red Devils have embarrassed their hosts, Newcastle often raise their performance levels to match their illustrious opponents. January’s comprehensive 3-0 win was one of those occasions: a display that was laced with class courtesy of the quite brilliant Yohan Cabaye. He scored a fantastic free-kick on that chilly evening and set the benchmark high for future performances. In truth, it is a level that he hasn’t quite matched this season but, on Thursday at least, he seemed to be coming back into some sort of form. That excites Harper, who pinpoints the France midfielder as a key man if Newcastle are going to replicate last season’s performances. United boast other players who will give Sir Alex cause for concern. Demba Ba has enjoyed a prolific start to the season, while Papiss Cissé’s smart volley on Thursday was a reminder of his class. The Senegal striker scored and rattled the bar in Newcastle’s narrow defeat at Old Trafford in the Capital One Cup last week – proof that he has ability to worry an injury-ravaged visiting back four. “It’s quite a match-up, isn’t it?” Harper said. “And don’t forget Shola, too, because he’s playing out of his skin. He was outstanding against Bordeaux. He led from the front and gave a real captain’s performance. Our manager certainly has options. “Someone said to me, it will probably end up 6-6. Well, I’ll take the point, but I don’t know about conceding six goals! “All this talk about top-quality strikers and how many goals they are going to score . . . how am I going to get to sleep at night? “But no, seriously, it’s games like this that you look forward to. While Harper capitalises on his impressive return to favour, the substitutes’ bench will feature a player at the opposite end of his career. 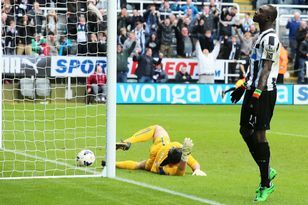 Teenager Jak Alnwick will provide youthful back-up with both Tim Krul and Rob Elliot injured. It is some responsibility if anything happens to Harper, but the veteran is convinced that the England Under-20 international would be fine. “Jak has been involved in the England set-up for a while. He has experience of playing in big games so I am sure he will be fine,” Harper said. YOU had to mount a forensic search for positives in the wake of a torrid weekend for Newcastle United, but the name Ferguson should provide some grounds for black and white optimism. ALAN Pardew is targeting a repeat of last season’s “special” defeat of Manchester United – and wants a fever-pitch St James’ Park to play its part.